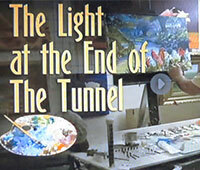 Here is a marvelous profile of Eric Hartman by Fox 8 in New Orleans. MA award-winning journalist, Nancy Parker, interviewed Eric about how he is actually able to work as a sight-impaired artist, an overview of his artwork, adjusting to CHM in his life and his work the with CRF. This story truly captures Eric and gives you some insight of the man behind the title Art-Man! A collection of Eric's photography and paintings are currently on exhibit at the Clever Wine Bar from 4pm to midnight daily. I just received a copy of the newest book on Painting Impressionist Color by Lois Griffel and I am honored to say one of my works was chosen to be included in the book. Having long since developed the habit of picking up books on painting to seek inspiration for my own work, it's rather surreal to open a book and turn a page to see one of my own paintings, “Stroll to the Bridges, City Park”! Even more humbling was to read the author’s description “…This lovely painting has a great deal of color richness. 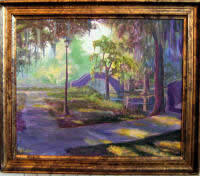 The contrast of the Golden lights begins to cool violets and blue embodies Impressionist color…” Wow! That is pretty darn cool! 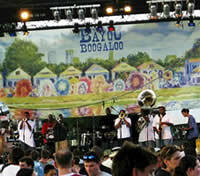 My art takes the stage again on Bayou St John for Bayou Boogalo. How cool is it to see your art as the backdrop?